Lawrenceville, GA, office specializes in insurance fraud and criminal cases. Consulting civil and structural engineers and land surveyors. Located in Lawrenceville, New Jersey. Based in Lawrenceville and services the metropolitan Atlanta Area. Includes profile and contact details. CPA firm in Lawrenceville offers job cost/construction accounting, payroll, taxes and business analysis/valuation. Highlighted are designer profiles, lists of favored manufacturers, photos, and contact information. Located in Lawrenceville. A hospitality and errand service company located in Lawrenceville, Georgia. Includes rates. Lawrenceville firm offering accounting, tax, business valuation, and forensic accounting services. Offers personal insurance as well as coverage for business, non-profits, and sports. Located in Lawrenceville. Provides training primarily with Diamond Aircraft at the Lawrenceville airport. Details of rates, ratings and fleet. Translation, editing and proofreading of English, Spanish and French into Russian and Ukrainian in the medical, computer and technology fields. Freelancer based in Lawrenceville, NJ, United States. A full planning service specializes in engagement parties, fashion shows, charity events, reunions and sports parties. Lawrenceville, NJ. Southfield. Serving the school districts of Farmington/Farmington Hills, Novi, Lawrenceville, Brighton, Hartland, Howell, Fowlerville, and South Lyon. Information on flight training programs for private pilot, commercial and ATP licenses, instrument and multi-engine and tailwheel ratings. Provides rates charged. Based at the Lawrenceville / Gwinnett County airport. A full-service design firm providing art direction and all types of print advertising, marketing collateral and web design from conception to production. Lawrenceville, New Jersey. Custom low altitude oblique and overhead photography for commercial buildings, real estate promotion and evaluation, landscape, accident site review, farms, construction progress, and estate homes. Based in Lawrenceville. Lawrenceville based company offering print design including annual reports, product identity, direct mail, and signage, plus web site design. Online capabilities list, portfolio, and list of clients. Offers current and retired villages, accessories, and figures. Includes showroom hours, directions, and map. Located in Lawrenceville, New Jersey. Shocks for racing and street rods. Technical information online including calculators. Secure catalog with photos. Sponsorship schedules. Lawrenceville, Georgia. Site for the Lawrenceville Schools crew team. General information, Schedule, results, pictures and links. Lawrenceville, New Jersey, neurology practice. Specialties include neuromuscular disorders, stroke, epilepsy. An AKC licensed club in Lawrenceville, GA. The club sponsors conformation agility and obedience trials, seminars, breeder referral and training classes for conformation and obedience. Site includes club history, event information, calendar, facilities and training details, and photos. Kennel history, accomplishments, litter announcements and photographs. Lawrenceville, Georgia. Reaching back through time to bring forth the classic all round Bouvier. Lawrenceville, Georgia. Staff biographies, list of services, and clinic forms. Lawrenceville. Also offers boarding, bathing, and food and supplies. Staff profiles, photographs, and newsletters. Lawrenceville. Includes program information, meeting location and time, den profiles, leadership contacts, and activity calendar. Located in Lawrenceville, Georgia. Includes articles, events, patient information, resources and videos, physicians and services. Meets in Lawrenceville, Gwinnett County. Projects, bird walks, and programs. Includes program information, meeting location and time, den profiles, leadership contacts, and an activity calendar. Meets at the Atkinson Road Baptist Church. Located in Lawrenceville. Site features hours, directions, rental and paint prices, group/party information, photos, and forum. Program, staff, application request, photographs, links, and contact details. Focuses on ages 8 to 16 and held at Drew University and Lawrenceville School in New Jersey. Located in a restored 1902 church in the Pittsburgh suburb of Lawrenceville, this brew pub offers a diverse, and untraditional menu. 9U-14U travel baseball teams based in Lawrenceville, Georgia. Includes schedule, statistics, and links to individual sites. Specializing in infertility, obstetrics, gynecology, menopause, high risk pregnancy, adolescent gynecology. Located in Lawrenceville, Plainsboro, and Hillsborough. Web and logo design services. Located in Lawrenceville, Georgia, U.S.A. Designing and developing web sites. Based in Lawrenceville, Georgia. 47 Saint Edwards Episcopal Church Lawrenceville, Georgia. services for criminal defense from offices in lawrenceville. 49 Sola Fide Evangelical Lutheran Church & School Lawrenceville, Georgia. lawrenceville attorney offering drunk driving defense services. lawrenceville firm offering a wide range of legal services. lawrenceville attorney emphasizing traffic offenses and drunk driving defense. Meets on the 1st and 3rd Thursdays, 8:00 PM. Photos, history, community and calendar. Provides an adoption and foster program for homeless animals as well many other programs and services. lawrenceville attorney, offering representation for divorce and family issues, and consumer bankruptcy. lawrenceville and marlton law firm focusing on elders and people with disabilities. also has an office in yardley, pennsylvania. Provides an adoption and foster program for homeless animals as well many other programs and services, located in Lawrenceville, Georgia. Lawrenceville. History, mission statement, Mass schedule, calendar, organizations, staff directory, contact information. 59 Rising Sun Christian Church Lawrenceville, IL. Lawrenceville, Georgia (nondenominational). Bible lessons, contact details, map and directions, staff biographies, description of ministries, and service times. Worship schedules, church information including education, music, Outreach and other programs, staff and vestry, parish life and history. Includes worship and 'Music for Missions' schedules, United Methodist Men activities, and prayer request form. Interpreter for the hearing impaired. 71 Pleasant Ridge Christian Church Lawrenceville, IL. Lawrenceville, IL. Address to church, email address, phone number to church. A memorial to George Air Field in Lawrenceville, Illinois. George Field was an Army Air Training school during World War Two. Includes history of the base, image gallery, and links to related sites. Lawrenceville. Lists dance nights, special events, and photographs from previous dances. Produces hand made, custom built, classic style guitars. Located in Lawrenceville, Georgia USA. SiteBook Lawrenceville City Portrait of Lawrenceville in Georgia. 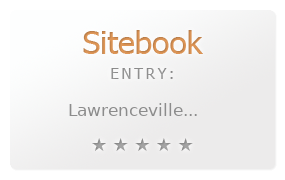 This Topic site Lawrenceville got a rating of 4 SiteBook.org Points according to the views of this profile site.